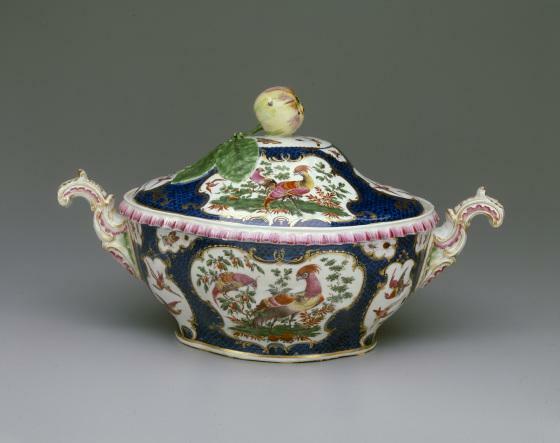 This early example of Worcester Royal porcelain has multiple panels featuring pheasants and foliage. 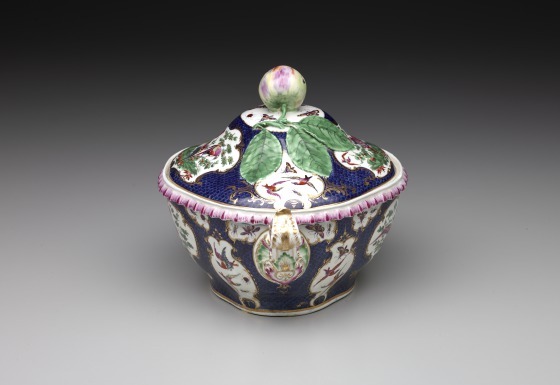 The lid is topped with a naturalistic green apple with stem and leaves while the edges are trimmed in pink. 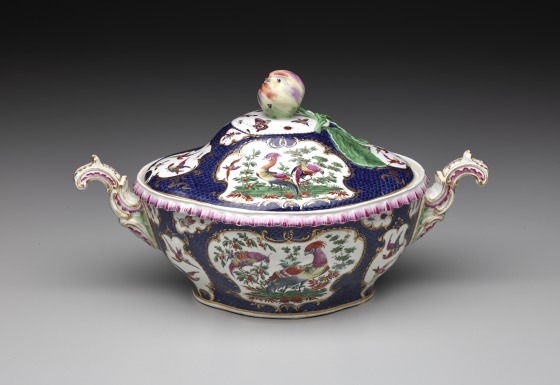 Oftentimes, tureens and dinnerware were decorated with imagery that referenced the intended dish contained within; for example, in this tureen, one could potentially expect to find a dish made of pheasant. 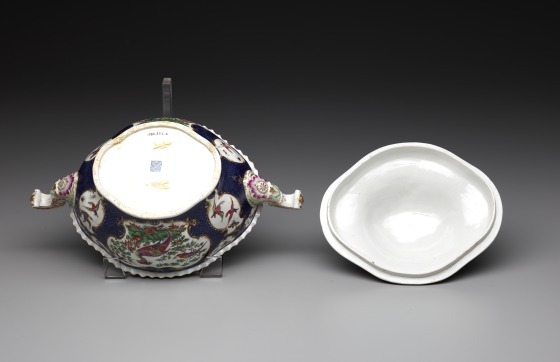 The English were late to enter porcelain manufacture, founding their first porcelain manufactory in the 1740s. Because the Germans and French already had successful factories, the English closely followed the designs of their continental rivals. 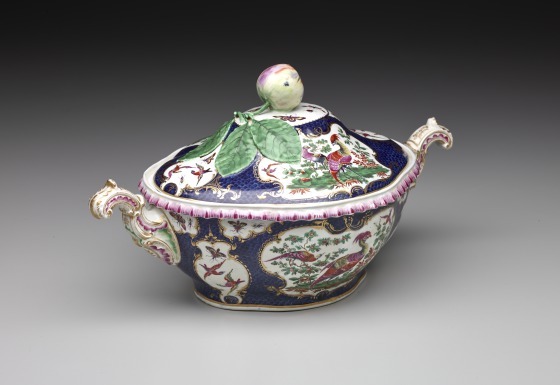 This tureen uses the blue scale ground decoration seen in designs from Vincennes in France. The French had copied the pattern from the Germans, who had adapted it from the Chinese. 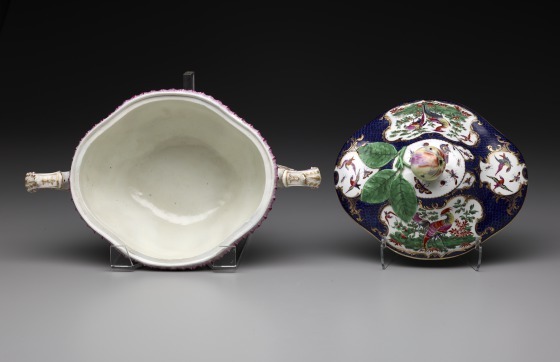 The Germans were the first Europeans to produce porcelain on a large scale. 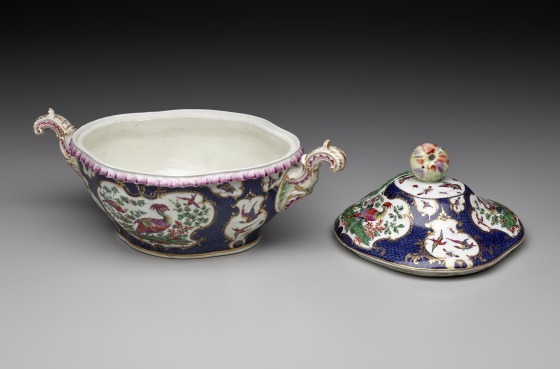 At Meissen in 1709, they succeeded in replicating the Chinese technique of mixing together a refined white clay (kaolin) and feldspathic rock (pentuntse) to produce porcelain. DMA unpublished material, Museum of Europe Label Text, 1993.